Second, the Romans did not plan to conquer and control Italy. No Roman cabal in the fourth century BCE sat down with a map, plotting a land grab in the territorial way that we associate with imperialist nation-states in the nineteenth and twentieth centuries. For a start, simple as it sounds, they had no maps. What this implies for how they, or any other 'pre-cartographic' people, conceived the world around them, or just over their horizons, is one of history's great mysteries. I have tended to write of the spread of Roman power through the peninsula of Italy, but no one knows how many -- or, realistically, how few -- Romans at this date thought of their homeland as part of a peninsula in the way we picture it. A rudimentary version of the idea is perhaps implied by references in literature of the second century BCE to the Adriatic as the Upper Sea and the Tyrrhenian as the Lower Sea, but notably this is on a different orientation from ours, east-west rather than north-south. 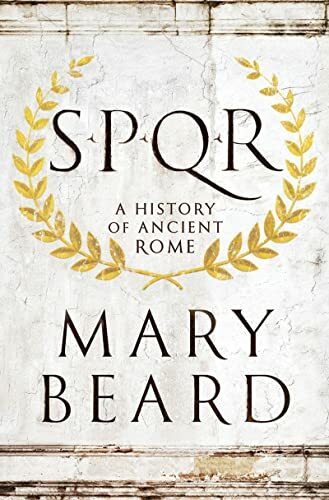 Mary Beard teaches classics at Cambridge University, and she writes an entertaining blog, so it is no surprise that this book, highly recommended in many best-of-the-year lists, has been an engaging read. For anyone with an interest in some facet of ancient Rome -- the area I teach regularly is its art and architecture -- will find here a concise but detailed account of the city's history, separating fact from fiction, historical truth from received notion. Prof. Beard opens up ways of looking into that ancient world, as in this passage about how the Romans, without maps, even conceived of the Italian peninsula.